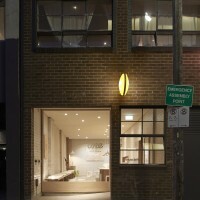 Architect Rob Mills has designed One Hot Yoga, a yoga studio in Melbourne, Australia. 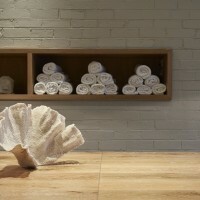 Melbourne’s yoga community has found a new home at Studio 2: the latest addition to South Yarra wellness retreat, One Hot Yoga. Hidden amongst the apartments and car parks of River Street, Studio 2 offers a cooler alternative to traditional hot yoga, its temperate 27 degrees space host to classes that focus more upon practice than heat. Its predecessor and sibling, Studio 1, still caters for those who like it hot, staging 60-minute sessions at 37 degrees. Housed in a converted factory, both studios were designed by architect Rob Mills, who set out to produce an uplifting and healthy sanctuary for hot yoga devotees. To do this, he combined state-of-the-art design with a low-energy panel heating system – the only one of its kind in Australia. 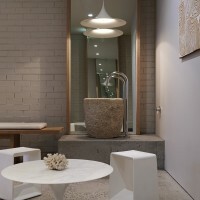 As a result, the space is a pleasure to spend time in, its subtle warmth evoking the ambience of a tropical island. From the moment you step inside, it’s clear that One is a studio with a difference. Clean lines, recycled materials and textured fabrics create an environment that resonates with the yoga principles of calmness and contemplation. The glass-fronted foyer offers a gathering place between classes, where visitors can replenish water bottles from the stone fountain or catch up with fellow yogis. 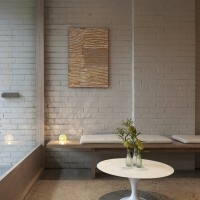 Here, polished concrete floors, wide timber benches and a monochromatic colour scheme dressed with Australian artwork create a luxurious setting. 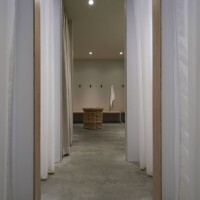 Moving down the hall, change rooms tucked behind heavy drapes provide a spa experience in the form of deluxe showers, organic soaps and an Ayurvedic body- and hair-care range created especially for the studio by Rasasara Organic Skinfood, which is also available for purchase. Inside each studio, instructors draw upon the likes of Iyengar, Ashtanga and Jivamukti yoga styles to deliver a substantial workout against a soundtrack of contemporary tunes. Says studio co-founder and instructor Lucinda Mills: “My approach to yoga has always been practical, focusing on the practices that are most effective.